For a different application, vinyl cutting machines are gradually finding its usefulness. A person passionate about craft will always like to prepare beautiful impressions. It is impossible to create beautiful impressions as per the imaginations in absence of suitable machine. When you are facilitated with an appropriate cutting machine, you can foster your creativity. To let the craft loving people prepare eye-catching and elegant impressions, the market consists of vinyl cutting machines. You can use this product to create silk screens for tee shirts and other projects. It is quite easy to make stickers and you can cut out shapes for use on signs and many other items. The classic white colored Silhouette cameo cutting machine is basically a DIY machine equipped with advanced software. These vinyl cutting machines come with the biggest cutting space. Furthermore, its versatility allows the machine to use for a variety of applications to make the investment worthy. You are able to create a beautiful impression from your computer, smartphone or tablet. The Silhouette machine makes use of a tiny blade to cut more than 100 materials. These include materials like paper, vinyl, cardstock, and fabric with width up to 12 inches. It owns the potential to cut printed materials and it is found PixScan compatible. This advanced vinyl cutting machine makes use of the powerful Silhouette Studio design software. With the assistance of this software, you can create your own projects. Implementation of the Bluetooth technology facilitates wireless cutting and allows the machine to plug into the computer. In all these vinyl cutting machines, there is the availability of dual-carriage for multi-tool use. Besides, there is the presence of 2 mm clearance to cut dense materials. This machine is the only Silhouette compatible equipped with the self-adjusting AutoBlade. 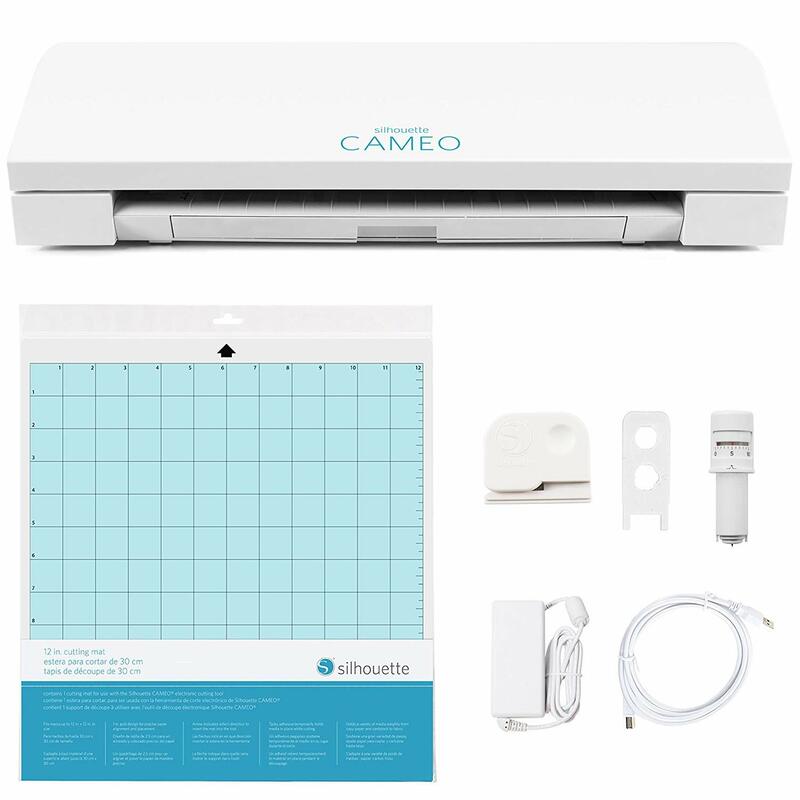 The package contains necessary accessories like this Silhouette vinyl cutting machine, Silhouette Studio software, USB cable, and power cable. Furthermore, it also includes 12-inch cutting mat and AutoBlade cutting blade. Blade and storage compartments work to keep all the additional blades and Silhouette tools in an easily accessible storage compartment. Customers who used this Silhouette vinyl cutting machine admire the templates in the software. This allows the user to visualize the size of the design. There are some customers who complained about the lengthy setup process for accomplishing the simple cutting task. Overall, this vinyl cutting machine performs excellently to fulfill all the basic requirements and come with advanced software. Excellent workmanship is featured in this MKCUTTY vinyl cutte r. The aspects that lure the attention of people to have it are the durability, metal streamlines modeling and low noise performance. Its construction features aluminum alloying structure to enhance durability and sturdiness. This 27″ vinyl cutter is excellent for electronic construction, advertising signage, drawing, hot cutting contour cutting map, mold, label, PVC label, and small batch hard brush cutting industry. In these vinyl cutting machines from MKCUTTY, the working process is based on the humanized operation. The availability of the emergency reset button feature enables the user to halt cutting and restart. During situations of cutting errors, the reset button assists to clear the data and begin the operation again. It comes with the U disk offline for flexible applications. This machine can work offline without making a connection to your computer. In the cutting and batch inspection operations, this machine helps to save the batch fixed time. The MKCUTTY 27″ package includes a strip power cable, a strip USB connector, and a strip signal wire. Besides, it includes three branch carving tool, a pen cap set, operation manual, and a certificate. For operating these vinyl cutting machines, there is the need for proper instructions. However, some customers mentioned the lack of proper instructions to complete the setup process. On the other hand, most customers praised the flawless working of the software. Therefore, you can use this machine seamlessly after understanding its working process thoroughly. With limited inputs, the Xyron 624632 machine can accomplish lots of tasks. The unique specialty about this creative station is it comes with 25 feet of Permanent Adhesive. This allows you to begin creating beautiful impressions instantly. The presence of cartridges allows these vinyl cutting machines to work on a different project without any hassles. Consequently, there are lots of options to add laminate, adhesive, or magnet into your projects. To guarantee effective results, the included cartridges drop into place easily and quickly. This enables the user to alter functions to flawlessly accomplish your project. 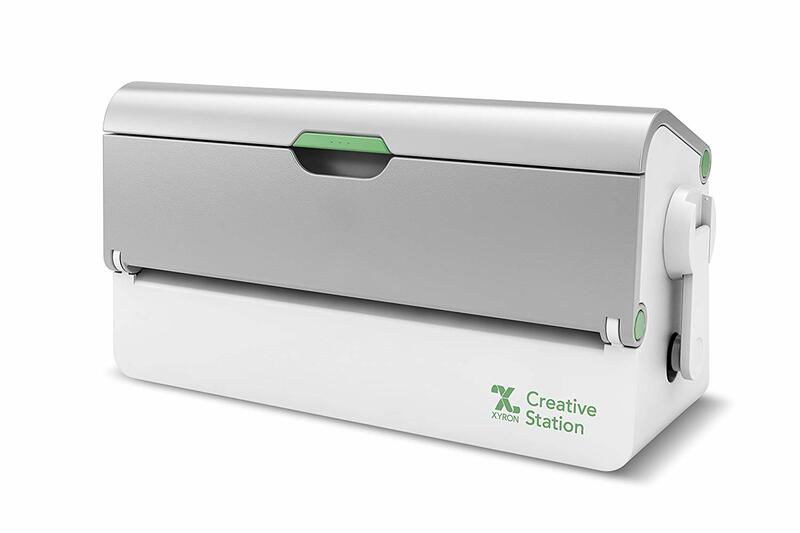 This creative station allows you to use 9 inch and 5-inch creative station cartridges. With the help of these cartridges, different projects whether small or big can be successfully completed. Due to its compact style and folding crank handle, this creative station would not occupy much space on the desk. The vinyl cutting machine facilitates excellent flexibility with less material waste. This is accomplished with the use of two cartridge sizes in a machine. It can flawlessly work with the 9 inch and 5-inch adhesive laminate and adhesive/laminate based cartridges. You will find laminator, magnet maker, and sticker maker in this unit. For its operation, there is no need for electricity or batteries, so it is an eco-friendly vinyl machine. The names of available cartridges are permanent/repositionable adhesive, laminate/magnet, two-sided laminate, and laminate/adhesive. Glancing at the reviews of customers, the casing and the crank handle are a bit flimsy. Besides, the machine unit is not well balanced when you crank it. The cartridges come with versatility and they are reasonably priced. 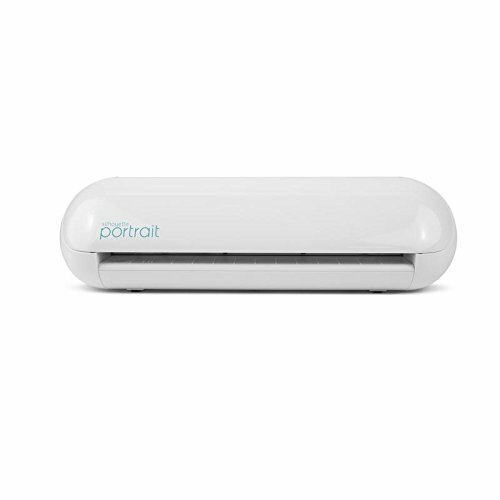 The silhouette portrait 2 basically is an electronic cutting machine designed specifically for personal use. Resembling a home printer, this cutting machine directly plugs into your PC or Mac through a USB cable. The working operation is simple and efficient. It uses a compact blade to cut paper, vinyl, cardstock, fabric, and many other materials with a maximum width up to 8 inches as well as maximum length up to 10 feet. Especially, the functionality of custom labeling is rarely found in other cutting machines. From this Silhouette America vinyl cutting machine, custom labeling is possible from a computer with the help of colored vinyl. The new Silhouette portrait 2 electronic cutting machine depicts Bluetooth technology for use from distance. This unit is flawlessly compatible with the new auto blade of Silhouette and PixScan. It comes with the capacity to register and cut printed materials. With the assistance of 2 mm clearance, these mini vinyl cutting machines work well with the deep-cut blade. This clearance assists you to cut thick materials. It can cut more than 100 materials like paper, magnet paper, fabric, vellum, cardstock, heat transfer material and adhesive vinyl. The machine comes loaded with the free Silhouette Studio for PC and Mac. For easy plugging, the machine comes with the USB and power cord. The customers who tried this portrait 2 vinyl machine are pleased with the minimal assembly. It is quite effortless to set up this machine without any troubles. Some customers did mention that it will be fine if the vinyl machine comes with proper instructions. There are lots of advanced functionalities and technologies to facilitate user with convenient cutting mechanism. Brand Brother is popular for manufacturing all its types of equipment with cutting-edge technologies. This electronic cutting machine is one of them. Developed with the recent technology, CM350 vinyl cutting machine depicts an implausible innovation with the simplicity of use. This standalone machine presents artists the liberty to create unique creations with the push of a button. 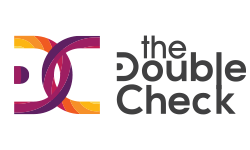 Users will be facilitated with ease of directly connecting to a PC or via wireless mode and scan images thereafter. Moreover, one of the best qualities of these vinyl cutting machines from Brother is the enormous cutting area. This cutting area assists to cut and draw a wide range of designs and shapes with accuracy. 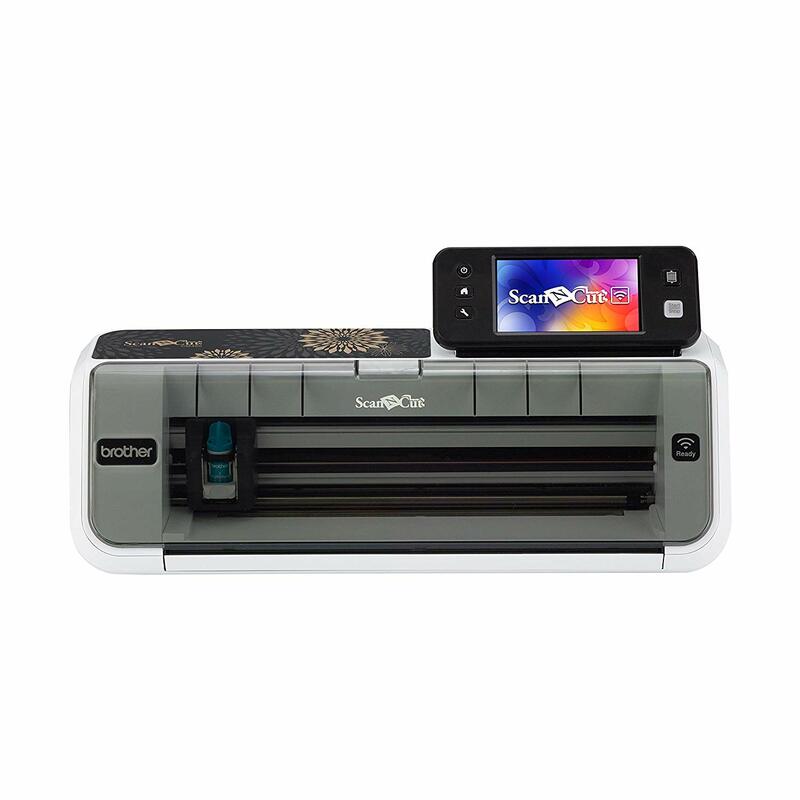 Using the 300 dpi built-in scanner, this Scanncut2 machine can transform your scanned images into exceptional cut designs and patterns. There is a giant LCD touchscreen of size 4.85” to let you select the functions easily. It is quite easy to edit the designs on this touchscreen. It allows lots of connectivity options like PC connectivity and standalone/wireless network connectivity. To cut an extensive range of designs, you can utilize the incorporated 12” x 12” cutting mat or can shift to a big mat. 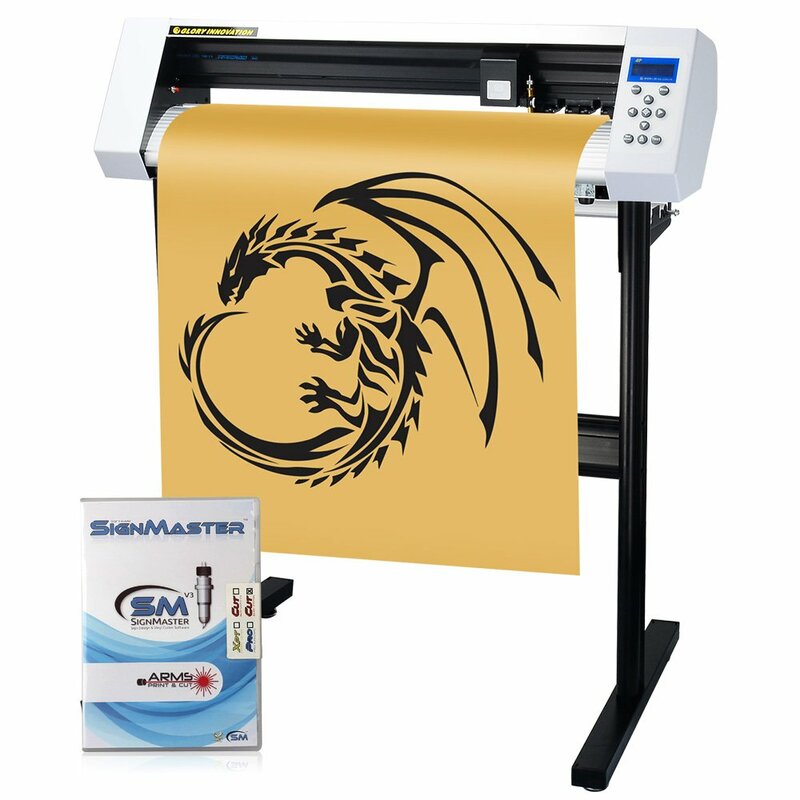 These CM350 vinyl cutting machines come with built-in designs and fonts. So there is no need to pay extra fees or go for subscriptions. The SVG data readability function allows you to use the art files you already possess and there is no need to purchase extra. The simplicity of use and a wide range of functionalities are the noteworthy qualities of this CM350 machine according to customer reviews. There are lots of advance options making you feel you are using the most cutting-edge machine. Overall, there are no hassles in cutting and the operation is user-friendly. The USCutter vinyl cutting machines are prepared with the special vinyl cutting software for making vinyl signage. Its VinylMaster Cut enables the user to generate an extensive array of vinyl lettering, general signage, and pinstriping. The best thing about this machine is it is equipped with not only a set of text, curve but also object tools too. Now it is quite simple to implement the creative vision into practice. You can employ the imaginative impressions into ready to cut computer image file. This will be made possible with a personalized and intuitive interface. There are three fully adjustable pinch-rollers enabling you to utilize the smooth range of materials. Implementation of the excellent ball-bearing dual roller media roller mechanism makes it easy to use. With the assistance of the Roland compatible blade holder, you will gain access to the affordable blades obtainable on the market. The package contains vinyl rolls, magnetic blanks, transfer tapes, squeegee, knife, and also lifetime phone support. In this machine from MH-Series of USCutter, fonts are vectorized and they are ready to cut instantly. This allows the user to draw shapes, edit images, personalize text, change signs, generate logos, and much more. Taking a look at the experience of customers who used this machine, they expressed that the unit is large. So, this vinyl machine is not dedicated to the hobbyist. Considering the positive reviews, the entire unit is quite simple to set up on a laptop within minutes. You can now generate personalized cutting according to your imaginations with the help of this DIY cutting machine. Different things you can do are prepare personalized vinyl stickers, personalized home decor, exceptional greeting cards, custom-designed apparel, etc. In general, it is possible to upload your image or you can select from the huge library of Cricut. This library would consist of pre-made designs and projects. For simplicity of use, there is the availability of double tool holder to let you cut and draw in a single step. There is free access provided to Cricut’s simple design software i.e. Design Space. Using this functionality, you can design anywhere. With the use of the Cricut Design App on Android or iOS devices, you can devise and design. It is possible to create designs from your computer, smartphone or tablet. It comes with the Smart Set Dial guaranteeing the user to generate perfect cut. This dial allows this machine to cut at the precise depth and pressure for different material types. You can cut more than 100 materials using these vinyl cutting machines from Cricut. The brand presents an extensive range of materials particularly designed and verified for use with this machine. In addition, this includes vinyl colors, iron-on vinyl, faux leather, cardstock, specialty paper, adhesive foils, poster board and many more. At the negative aspects of this Cricut’s machine, customers mentioned the lack of software. Moreover, there are no facilities to download any software on this cutting machine. At the positive aspects of this machine, the customers admired the potential to cut different materials. The versatility of the Cricut Explore Air 2 Machine enables the design enthusiasts to cut more than 100 materials. This comprises vinyl, paper, iron-on and many more. Following this, for making elegant impressions, the requirement arises to often shift between drawing and cutting or scoring through the dual carriage. 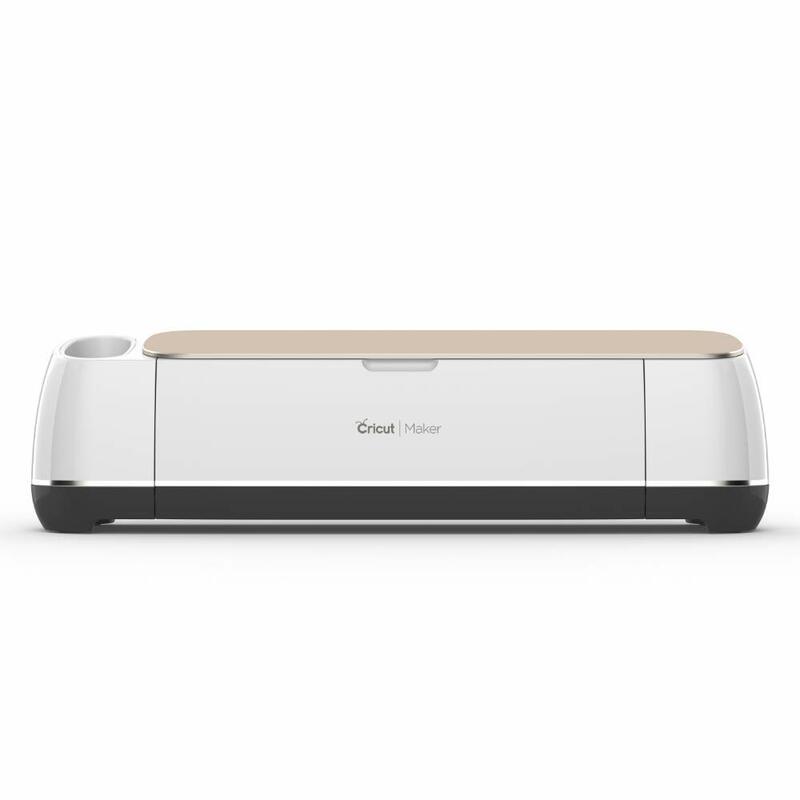 These vinyl cutting machines from Cricut allows you to seamlessly shift between the mentioned tasks. In addition, one of the most useful functionalities about this cutting machine is you can easily upload and download the projects in the required format. There are no hassles regarding downloading and uploading. 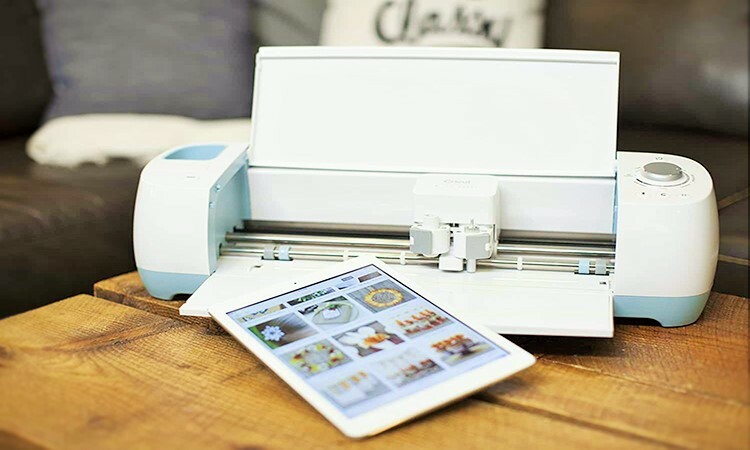 This Cricut machine comes with adaptable cutting and writing speed at twice the speed than the typical vinyl cutting machine. It is hassle-free to cut through a wide range of materials like paper, iron-ons, adhesive felt, lightweight leather, and burlap. With the use of the smart set dial, this machine flawlessly adjusts to the material setting. There is the implementation of the Bluetooth technique for wireless cutting and writing or scoring and cutting in a single step. You can use the Cricut Design Space online software with a computer, smartphone, tablet as well as iPad app. This software allows you to generate customized DIY craft projects. 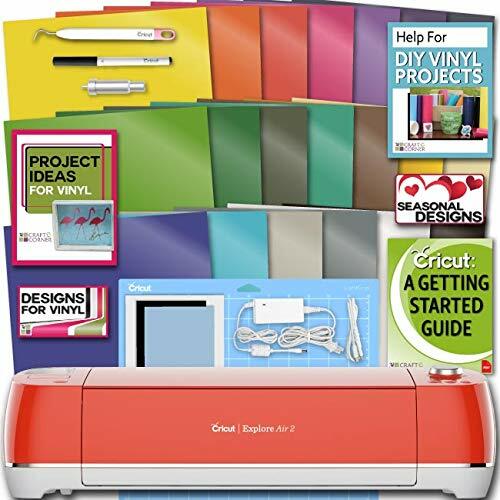 This unit can flawlessly work with the Cricut cartridges and prints printable images. There are no hassles to connect this machine unit through the built-in USB cord. Alternatively, you can cut wirelessly with Bluetooth technique and can create a design with the cloud-based Design Space App. You can upload own images in formats like .jpg, .svg,. bmp, .png, .gif, and .dxf) on PC, Mac or iOS devices. Besides, you can download the created projects to make use of the app offline mode. Customers praised the quick set up of these Cricut vinyl cutting machines. The box is devoid of instructions but the brand’s website consists of lots of instruction videos. In this cutting machine, the uploading/downloading process and adjustable cutting are the admirable aspects. For paper crafting projects, the operation of the cutting tool from Silhouette features intricate cuts, accurate duplication, and soft edges. Generally, wide access to thousands of downloadable designs is provided to let you transform your imaginations into practice. The included software is quite simple to use and it is fully functional. In fact, this software’s noteworthy attribute is it is available freely and presents a broad range of tools and functions. They would assist to make personalized projects instantly and easily. Also, this cutting tool is perfect for paper crafts, scrapbook layouts, cards, vinyl decor, custom apparel, sketch designs, and etched glass. 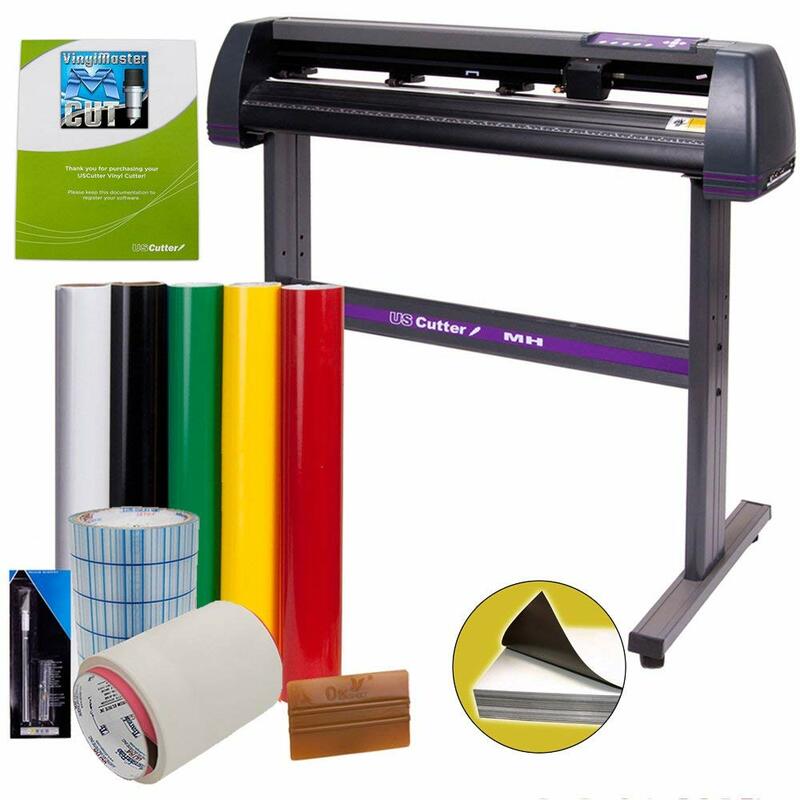 These electronic vinyl cutting machines are capable to cut up to 12-inch wide and 10-feet long. Right from vinyl to fabric, this cutting tool is accomplished to cut a wide range of materials. It can precisely cut thick and flexible paper. To make rich embossed images, the tool comes with the Curio’s “Score & Emboss” feature. This cutting tool is capable to create intricate projects of different sizes varying from small to large. In fact, it can cut from1/4″ width to 12″ width and comes with an unlimited cutting length. However, it is not mandatory to use a cutting mat. Looking at the customer reviews, its bright LCD screen with the touch-sensitive surface makes the operation simple. Furthermore, another admirable characteristic is the ability to scale the image up to 12×12. Now everyone can convert their imaginations to practice with this electronic cutting tool. There are few vinyl cutting machines which offer the users the freedom to cut different materials in their own way. Also, this machine presents the freedom to prepare paper crafts, vinyl decals, iron-ons, balsa models, and leather crafts. You can upgrade your crafting talents with the help of included pens, blades, and also a scoring tool. The expandable suite of tools assists you a lot to create the desired design. On the surface of this Cricut maker, there is the presence of advanced rotary blade. The blade employs rolling and gliding action to cuts through any fabric. However, there would be no compromise in the cutting accuracy. To streamline your sewing and quilting projects, you can select from hundreds of digital sewing patterns. The machine cuts and marks the pieces, so you just need to stitch them together. It comes with the docking slot to holds your tablet or smartphone. Besides, you can easily charge your device through the included USB port. Many customers are pleased with the straightforward and quick operation of these vinyl cutting machines from Cricut. Within a few hours, it is simple to create lots of impressive designs. Some customers mentioned the slight difficulty to create your own design. In general, the Cricut maker works great at the affordable price. It is pleasant to observe your imaginative designs into practice with the use of the best vinyl cutting machines. Lastly, according to your requirements and budget, you can pick any of these vinyl cutting tools to fulfill the requirements. The end results are alluring and make your investment worthy.